Fast and Efficient Freestyle and Backstroke Racing Camp – Sign up for one or SAVE by signing up for both days! 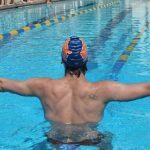 Freestyle and backstroke are both “long axis” strokes meaning swimmers rotate on an axis that reaches from head to toes. Participants at this camp will work on refining their freestyle technique to for a more efficient stroke on Saturday. Then on Sunday, the focus will be on powerful backstroke. This is “Elite” which means that each session is limited to no more than 36 participants. Leading each session will be Elite Clinician and Olympic medalist Kim Vandenberg! Kim has a talent for explaining and demonstrating the technique required for fast racing! Scroll down for more details on the curriculum! This camp will have two sessions for swimmers ages 12 & over and two sessions for swimmers ages 11 & under. The camp is not recommended for swimmers with less than 2 years of competitive swimming experience and swimmers younger than 9 years old should not sign up without their coach’s suggestion. Freestyle is the stroke that you swim more than any other. Creating good freestyle habits will help your swimmer race faster and help prevent injury in the future. 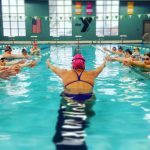 Olympic medalist Kim Vandenberg will be in the water leading participants through each part of the freestyle stroke and drills to help them create good habits and deepen their understanding of fast and efficient freestyle technique. At each session of this elite series, swimmers and parents are invited to ask the Olympian Clinicians questions during a Q&A session. Gain insight into their training regimen, diet and nutrition, and recovery tactics.